PRODUCT Plastic Water Tubes : บริษัท เอ็น.เอส.เค. พลาสติกไทย จำกัด | N.S.K. PLASTICTHAI CO.,LTD. Water Tubes For Flowers Orchids, Roses, Carnations Etc. The plastic water tubes are available in different shape, size and color according to the order. We've made white, green, purple colors. The plastic water tubes are suitable for different kinds of flower stem such as orchids, roses,lilies, tulips,carnations etc. 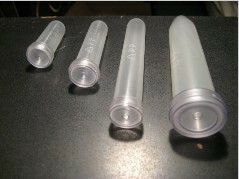 The plastic tube after filled with preservative solution or water. The flower stem can be insert into the hold in the middle of the cap. This will keep the flower fresh and ready for packaging. We do custom order on other plastic products (injection type). Other product we provide are small plastic flower pots. Let's us know your need and we'll provide you with the competitive price and quality products. © 2000-2008 CopyRight by N.S.K. PLASTICTHAI CO.,LTD.